Poson is celebrated to commemorate the introduction of Buddhism to Sri Lanka by Mahindain 236 BC. The festival is the most important Poya (full moon) holiday of the year This festival is celebrated as the arrival of Buddhism in Sri Lanka. It is a festival of great historical and religious significance, celebrated all over the island by the Buddhists. Poson Poya festival is celebrated in the month of June on full moon day, it commemorated the day over 2,000 years ago when Arahant Mahindra, son of Emperor Asoka of India, converted king Devanampiyatissa to Buddhism. The centre of the celebration of this festival is Mihintale. It is the place where royal monk Mahindra perched the first serom to the ruling king. For Buddhists, this greatly revered and honoured day is as equal to Wesak festival in terms of importance. Poson Poya is celebrated with a lot of enthusiasm all over the island but mainly it is celebrated in Mihinthalaya where Mahindra Thero first put his foot to peach the word of Lord Buddha, this is the main reason that this place is called the cradle of Buddhism in Sri Lanka. 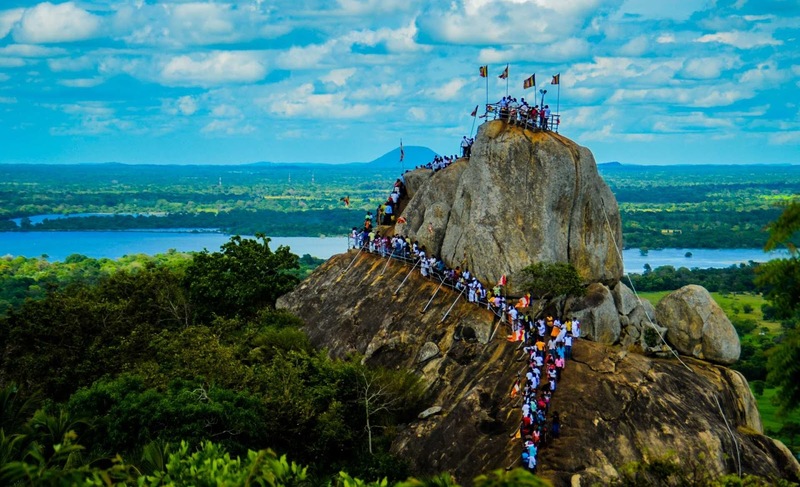 On this day-long lines of devotees dressed in white climbs the steps to the top of the Mihintale hill to the temple and then to the Dagobas that lie to the nearby hill rocks. Many devotees climb to the rock, to the spot where Arahant Mahindra delivered his initial discourses. Religious activities sil campaigns, bodhi Pooja’s, dansolas, poson devotional songs, poson pandols and lanterns are lighted by the people. The temples Gary filled with devotees and Buddhist monks all over Sri Lanka to mark this great event on poison poya, all in pure white with no makeup and jewellery, make their way to the temple to spend the next twenty-four hours in quiet contemplation. After sunset rest of the villagers gather at the temple ground to participate in other religious activities like reading of holy books or listen to the saffron clad monk relate ancient stories from Lord Buddha’s previous lives, the selling of alcohol and flesh stays prohibited. The streets, homes and public places are decorated with handmade paper lanterns small and big and glittering with illuminations, pandals depicting the different occurrences in the life of the Buddha or his previous births. According to the ancient data of the Mahawamsa chronicle, Thanthirimale become one of the vital halting locations of the procession bringing the Sri Maha Bodhi. Bhikkuni Sanghamitta and her retinue had rested right here for one night throughout the sacred adventure of bringing the Sri Maha Bodhi to Anuradhapura. A few years after the Jaya Sri Maha Bodhi took root in Anuradhapura, 8 new saplings emerged from the Bodhi. It is known that the primary of these saplings become planted at Thanthirimale. As a result of the conversion of Dig Vijaya policy of the emperor Dharmasoka to that of Dharma Vijaya coverage, Buddhist missionaries have been dispatched to numerous international locations in the global and to Sri Lanka. Emperor Dharmasoka sent his personal son, Arahant Mahinda Maha Thera to lead the delegation. Arahants Ittiya, Uttiya, Sambala and Baddasala followed Arahant Mahinda Maha Thera in this missionary. Sumana Samanera also joined them. The most effective layman on this project was Bhanduka Upasaka who had attained Anagami or the third of the four paths or ranges leading to Nirvana. 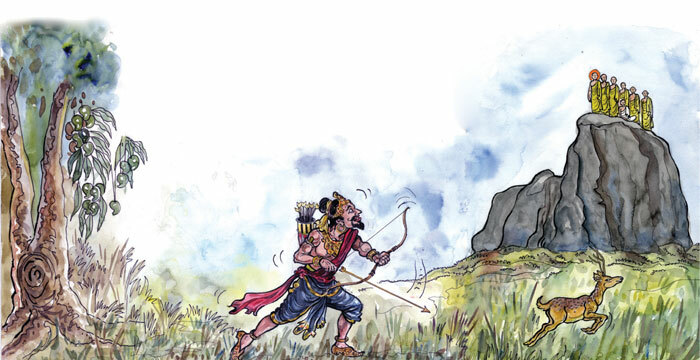 It becomes a pleasant day with excellent Weather and king Devanampiyatissa followed by using his men engaged himself in a sport of looking in the royal park, “Missaka Pawwa”. A well-built deer ran swiftly through the king’s side. The king had no time to spare. No one aside from the king himself became to kill the biggest deer on that festive day. He pulled out an arrow and aimed toward the deer. His arrow did no longer flow. A ray of mild radiated from the mountain pinnacle on the foot of which the king become standing. He heard his name being called in a candy voice. The king was significantly involved as to who in this world become dared to name him by his name. Further, possibly he could be sorry that he ignored his sport. However, he becomes not aggravated as the phrases had been pleasing. The king appeared up from the foot of the Mango tree where he turned into status dumb based and noticed the determine of a person in yellow robes with rays radiating from the spectrum. The king could not cast off his eyes away from this fascinating parent. He became surprised. “This need to be a supernatural being” the king notion. Hitherto the king saw handiest one determine. The other four arahants, the samanera and the upasaka too emerged one by one. Arahant Mahinda ascertained that the king changed into prepared to pay attention to him. For the powerful king, the attraction of Missaka Pawwa turned into that on it stood the treasure he was yearning for. His bow and arrow fell from his fingers. He positioned his fingers together on his forehead and knelt down at the ground under the Mango tree. Arahant Mahinda Maha Thera decided to test the king’s expertise and intelligence and to check whether or not he may want to apprehend the Dhamma via handing over it in the normal manner.